Can you hear it? This Dairy-free Spaghetti Squash Chicken Alfredo is calling your name. Healthy comfort food lovers unite! 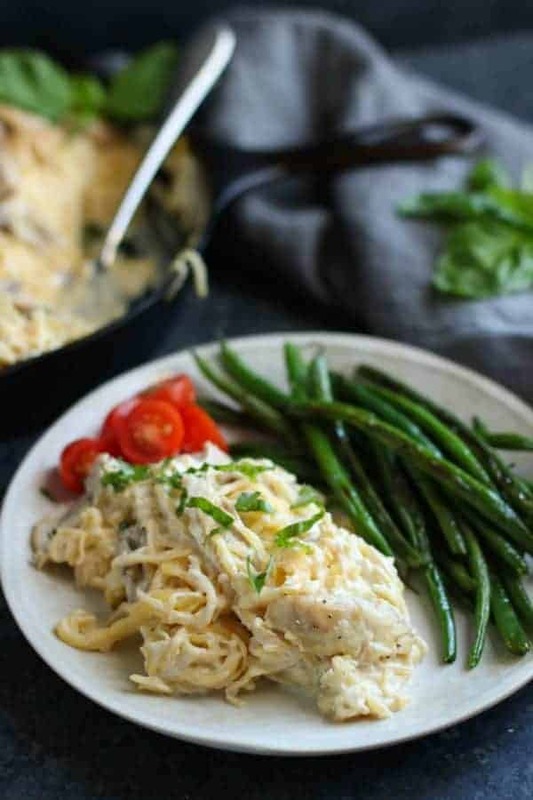 We’re so excited you’re here because this week we’ve partnered with our friends at Vitamix and The FeedFeed to bring you this Dairy-free Spaghetti Squash Chicken Alfredo recipe that’s perfect for meal prep! It reheats beautifully and makes enough for a meal plus leftovers. It’s also designed to make the most of your time because we know you don’t want to spend all day in the kitchen. Win-Win-Win. 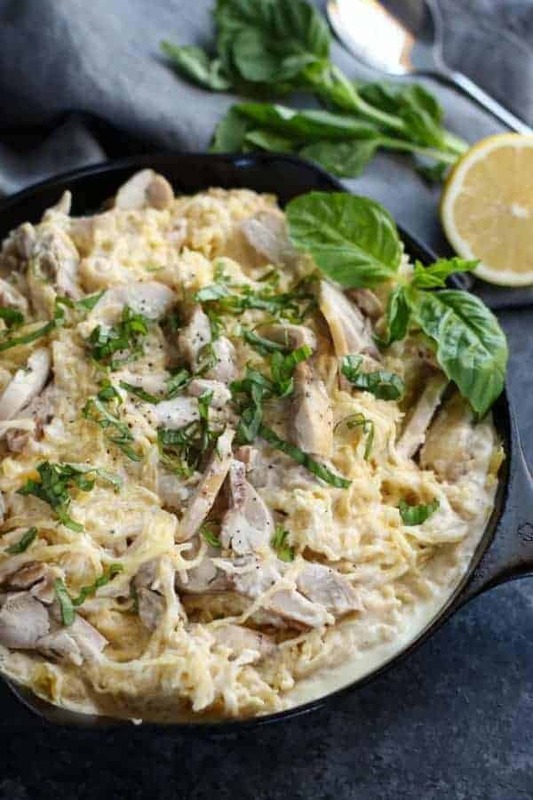 This Dairy-free Spaghetti Squash Chicken Alfredo is about to become your everything. Seriously, your everything. 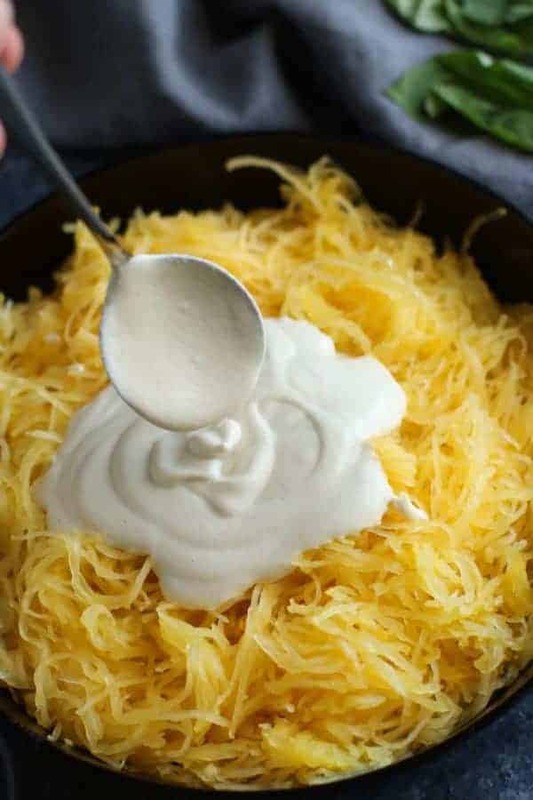 Not only will you get a big dose of healthy veggies thanks to the spaghetti squash standing in for pasta, but you’ll also get the most luxuriously creamy alfredo sauce that’s 100% dairy-free with far less fuss than making a traditional cream sauce. Curious how that can be? 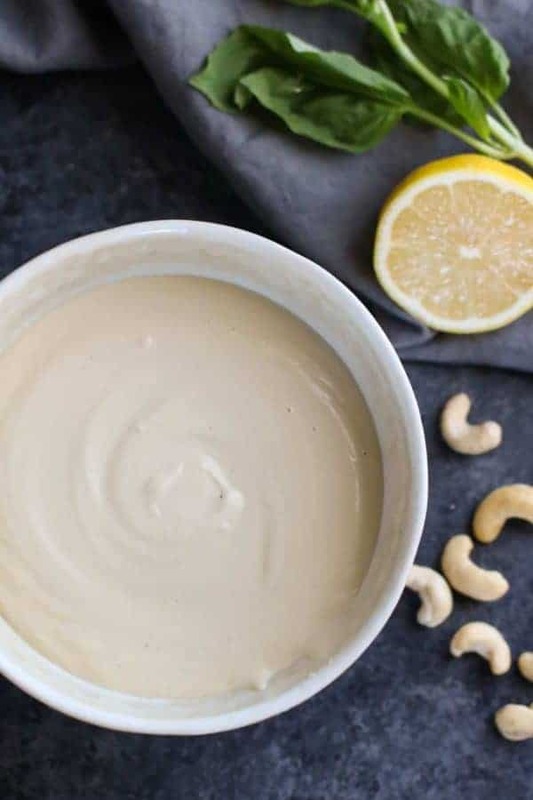 Here’s my secret: I owe that ultra-creamy consistency to raw cashews and my new favorite appliance, the Vitamix Venturist V1200 High Performance Blender. ((Swoon)) I’ve long been a Vitamix fan having purchased my first Vitamix ten years ago, so the fact that I am this excited about a new one should tell you something (<< I almost typed that in all caps, THAT’s how excited I am). Is my old Vitamix still running? You bet it is, and I’ve put it through the wringer over the past decade – making everything from soups to smoothies to butter to sauces and even using it to grind my own flours back in my bread-making days. It’s been worth every single penny. So why the upgrade? Well, as my life as full-time mom and full-time food blogger continues to get busier I need a machine that can do just a little more for me – like chop an onion while I peel the garlic. Or blend just enough smoothie for one kid while the other stands with the freezer drawer wide open deciding what she wants in hers (because WHY would they want the same thing?!). I also want my Vitamix to fit under my cabinet to free up a little more room on the counter when I’m in full on meal prep mode and counter space becomes precious real estate (my old one does not fit under the cabinet because it’s too tall). And that countdown timer? Priceless when I’m juggling fifteen things at once. The tamper holder? Brilliant. No more rooting through drawers to find it when I need it because now it’s right there where I need it…saving space. And don’t get me started about the blade scraper. No more wasted nut butter or alfredo sauce because I can’t reach it with a spoon. 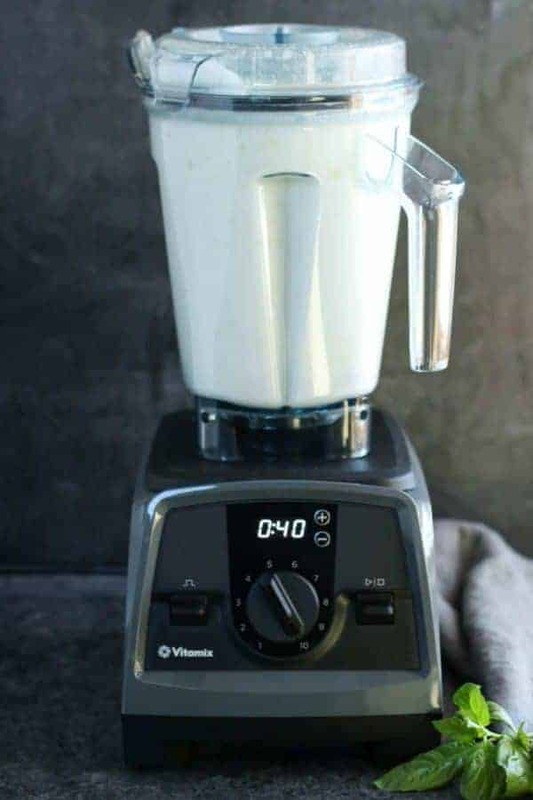 And that’s exactly what the new Venturist V1200 blender from Vitamix has given me – more tools, more functionality and more power at my fingertips (you know this thing can boil soup in just minutes, right? It can.) Did I mention that for all my fellow Costco fans that this blender is exclusive to Costco? Now you can stock up on your favorite real food finds and pick up the only blender you’ll ever need all in one place. It might be the best investment you’ll ever make. 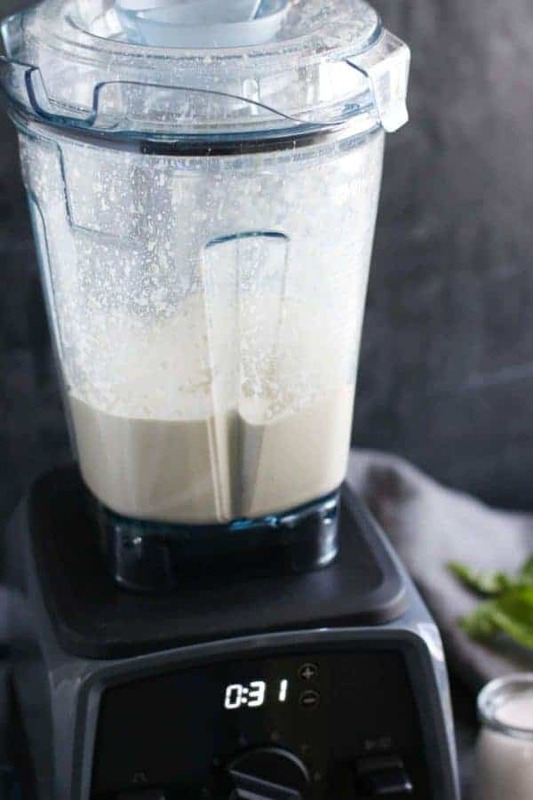 If you’ve ever tried to use a lower power or budget-priced blender to make a smoothie or a smooth and creamy sauce or soup only to find chunks remaining, then you can probably guess why I’m such a huge fan of the Vitamix. 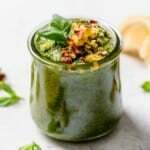 Not only can you make the smoothest smoothies and sauces you can also make chunky sauces and salsas and even make your own nut butters. Yes, you can make nut butters as chunky or as creamy as you like without having to stop and scrape down the bowl or worry about using too many or too little nuts because now you have options (Bonus: you know EXACTLY what’s inside ingredient-wise). The new Vitamix Venturist V1200 comes with a generous 64-ounce blending canister PLUS a 20-ounce and 8-ounce container with a detachable base and lids. This means you can now do more with your already ultra versatile high-powered blender. I really could go on forever about all the things I love about this machine but I know you came for the Dairy-free Spaghetti Squash Chicken Alfredo recipe so let’s get to that and I’ll show you just one way to put this machine to work in your own kitchen. Basically, here’s how it went down in my kitchen the other day. I then secured the lid and blended everything on high for 1 minute then tasted the sauce and decided I wanted a little more garlic and salt so into the blender when another clove of garlic and a pinch of salt before blending again. I then left the sauce to hang out while I tended to the spaghetti squash. 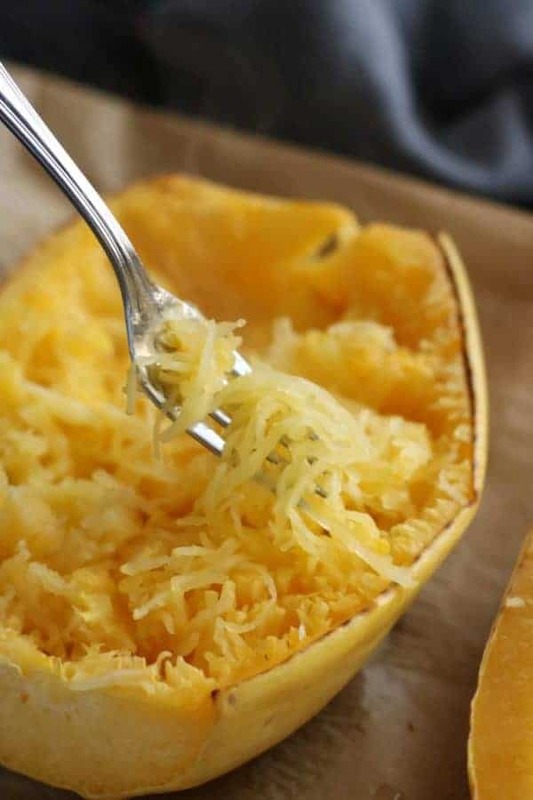 Perfectly roasted spaghetti squash! I roasted this 3 lb. spaghetti squash by placing it cut side down on a rimmed baking sheet at 400℉ for about 55 minutes or until it was soft to the touch and the flesh was tender (but not mushy). For a step-by-step tutorial on how to cut, clean and roast the perfect spaghetti squash, click here. Using a fork, I gently scraped the flesh into a large skillet (you can also use a bowl). See how pasta-like those stands of squash are? My mom was my recipe tester the day I made this and you know what she said after her first few bites? She said, “I just love how thin these noodles are.” I told you it was a great substitute for pasta – I even fooled my pasta-loving mama with this dish. Now it’s time for the star of the show – the dairy-free alfredo sauce. I mentioned earlier that you can actually heat foods in your Vitamix by allowing them to process at high speed for a few minutes. I turned the blender on for another 2 minutes while I set about slicing the chicken breasts that were waiting patiently undercover. Alternatively, if you’ve transferred your squash to a skillet you can skip the extra blending and just heat the squash, sauce, and chicken over medium heat until heated through. Totally your call, I just wanted to share that nifty little trick of using the Vitamix to warm the sauce. Don’t waste any of that creamy goodness! Since the blades of the large blender canister are not removable you’ll have to scrape as much from them as you can. Thankfully the new Venturist V1200 comes with a long-handled blade scraper that makes easy work of this task (and you don’t have to worry about slicing up your favorite rubber or silicone spatula with those really sharp blades). Clean up is a breeze with the Vitamix. All you have to do is fill the container ⅓-½ full with warm water and a drop of dish soap and set the countdown timer for 1 minute. Blend on high, use a dishcloth to clean the lid and outside, rinse, and voila! A clean blender that’s ready for your next kitchen adventure. Now, here’s the best part – stir in the chicken and basil, adjust salt and pepper to taste and serve. I served this with roasted green beans and cherry tomatoes to sneak in some extra veggies but you could serve it with a salad on the side, toss it with cooked broccoli or even stir a bag of fresh spinach into the mix when you’re adding the chicken and basil. See how ultra creamy that sauce is!? 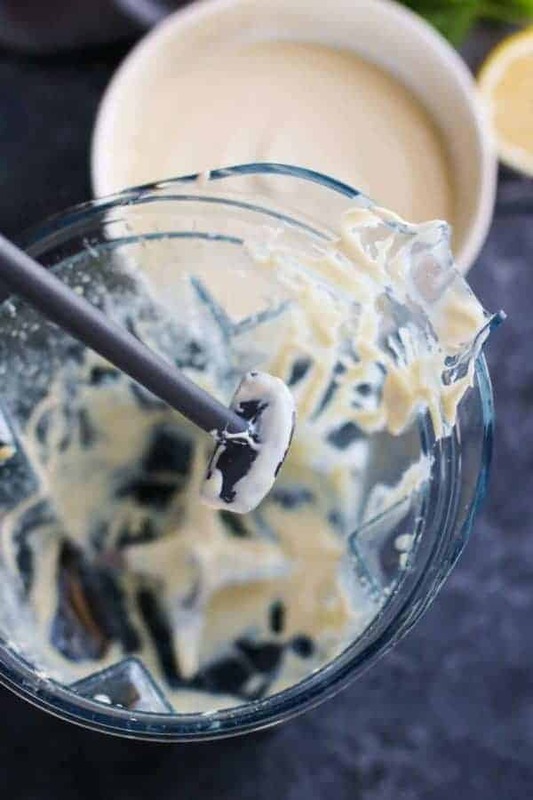 The secret to that lux creamy alfredo sauce is, you guessed it, the Vitamix. I’ve tried making cashew-based sauces in other blenders, and even my food processor and none of them gave me that super smooth consistency that you want in a dairy-free alfredo sauce. Especially considering the fact that I don’t soak my cashews overnight – I just do a quick 30-minute soak in hot water while I prep the spaghetti squash and chicken. It’s really all you need when you’ve got this much horsepower on your side. Pro Tip: The sauce can be prepped up to 3 days in advance and reheated when ready to use. 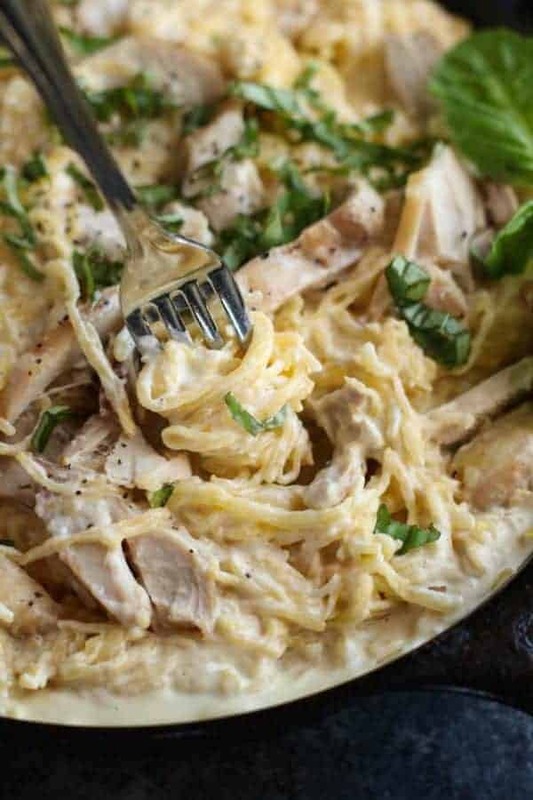 Now it’s your turn to reunite with an old comfort food love in this Dairy-free Spaghetti Squash Chicken Alfredo. Place cashews in a small bowl and cover with boiling water. Place a plate over the bowl to cover and allow to rest for 30 minutes while you prepare the squash and chicken. Line two rimmed baking sheet with parchment paper. On one sheet, place halved squash cut side down. Place chicken thighs on the other sheet and sprinkle with salt and pepper. Place baking sheets in preheated oven. Remove chicken after 25-30 minutes or when cooked through and no longer pink inside. Remove chicken and cover with foil or a plate. Allow squash to bake for an additional 20-25 minutes or until tender. While the squash bakes it’s time to prepare the alfredo sauce. 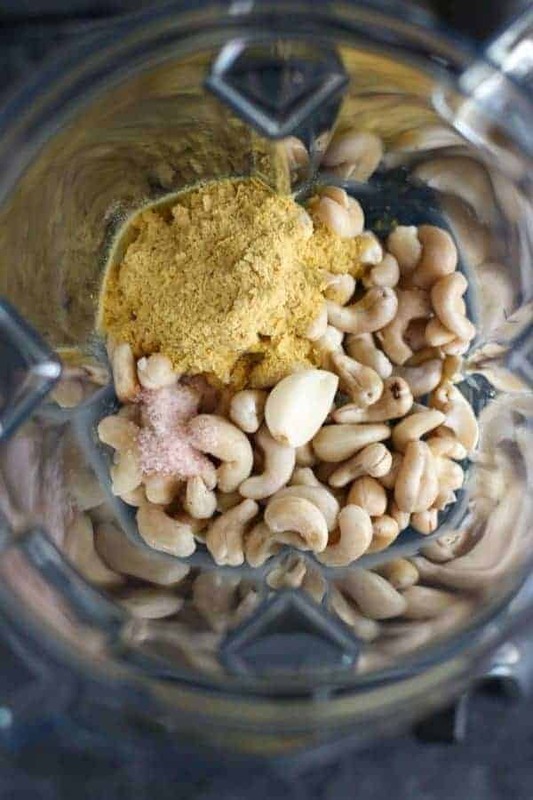 Drain cashews and place in the canister of the Vitamix. Add nutritional yeast, 1 garlic clove, lemon juice, ½ tsp. salt and almond milk. When squash is ready, carefully scrape flesh into a large bowl (or cast iron skillet) using a fork to create strands of ‘pasta’. Add diced chicken and toss with alfredo sauce. 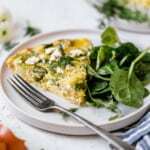 At this point, if your squash has cooled and if you used a skillet you can either place the skillet on the stove top over medium heat for 5-6 minutes or until heated through or pop the entire skillet back into the still-warm oven for a few minutes to warm while you prepare a vegetable or salad side dish. Stir chopped basil into spaghetti squash mixture just before serving. Top with additional basil, as desired. Do you own a Vitamix blender? What’s your favorite way to use it? Share in the comments below! This post was made possible by our friends at Vitamix and The Feed Feed. Though we received compensation for this post, the opinions expressed here are – as always -100% our own. Thank you for supporting the great companies we work with thereby allowing us to continue creating great recipes and content for you. This looks amazing! I found out while doing the Whole30 that cashews are not my friend. ???? Will any other nuts work with this? Thank you! That’s a bummer about cashews but it’s good that you know they’re not you’re friend. Macadamia nuts would give you a similar texture though possibly a bit sweeter. Would you need to soak the macadamia nuts as well? I would. You get a much a creamier sauce that way. I know your comment posted a while ago but I have trouble with raw cashews too. One Pinterest tip I learned is the longer you soak them, the easier they are to digest. So, I will soak cashews for a recipe all day before I use them. It has helped tremendously. You are absolutely correct. You can soak the cashews overnight in room temperature water then drain and use as called for in the recipe. I opted to use the quick-soak method for those times when you might not plan ahead — or just want some really good dairy-free alfredo STAT! I was hesitant to try this since nutritional yeast does not agree with me but went ahead and I am glad I did. I did add bacon and used coconut milk. Creamy and delicious. So great the hear Margaret! This was a great dish! I used Cashew milk and found it to be a great alternative to Alfredo. Thanks for sharing! Try the dish and also try it with shrimp and zucchini noodles – you won’t be disappointed! Awesome! So great to hear you enjoyed this recipe! 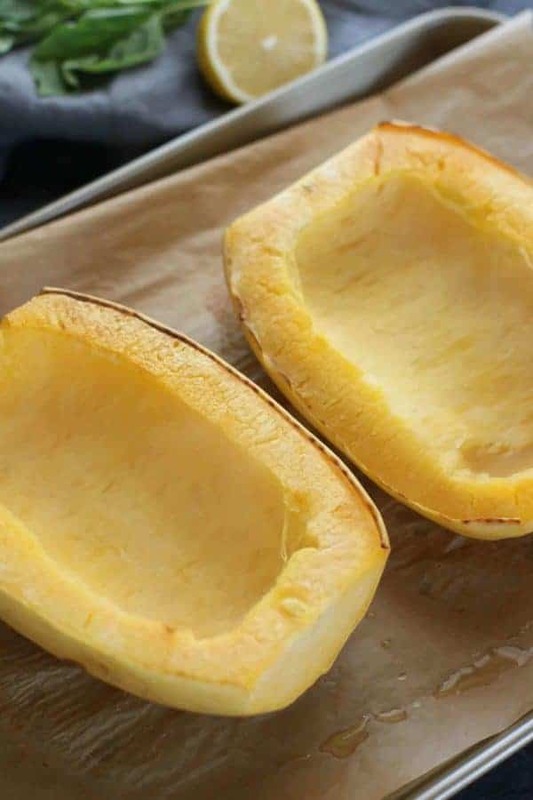 If you have an Instant Pot and want to get this done even faster… cut spaghetti squash in half and take the seeds out. 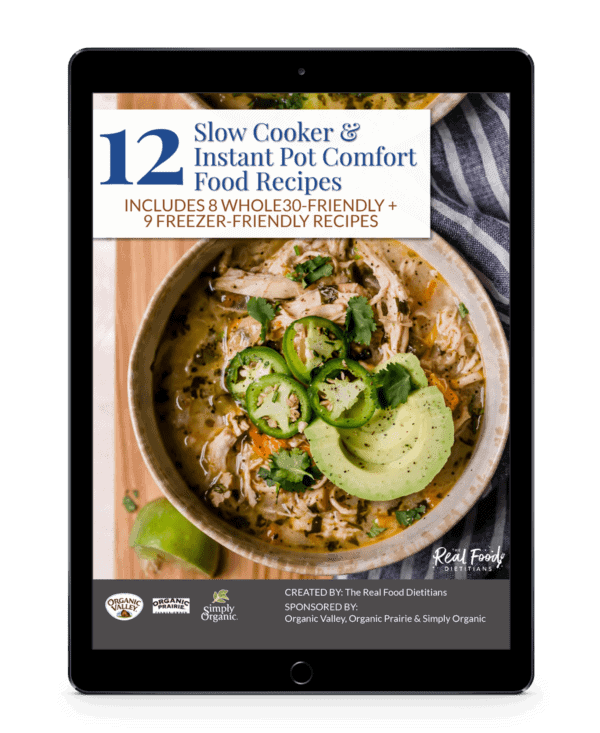 Place 1 cup of water in your Instant Pot and cook on High for 8 minutes. Release pressure and you can just squeeze the spaghetti squash out of the skin!!!! Omg this seriously looks so good – such perfect comfort food for the winter!! Hi! Is there anything you could use in place of the nutritional yeast? I’ve given it a try several times and am just not a fan. Thanks! I’m guessing you could use a little dijon mustard in place of the nutritional yeast to get that tangy flavor. Or you could just leave it out and it would be more of a white sauce than a cheese sauce – in which case I’d recommend adding some dried Italian seasoning to the sauce to give it some extra flavor. I made this tonight and it was delicious! I sautéed the chicken since I have a small oven. Thanks for so many delicious Whole30 and other recipes! I love your site- the egg roll stir fry was another hit. Thank you for your kind words – we’re so thrilled you found us and found some new recipes you love. 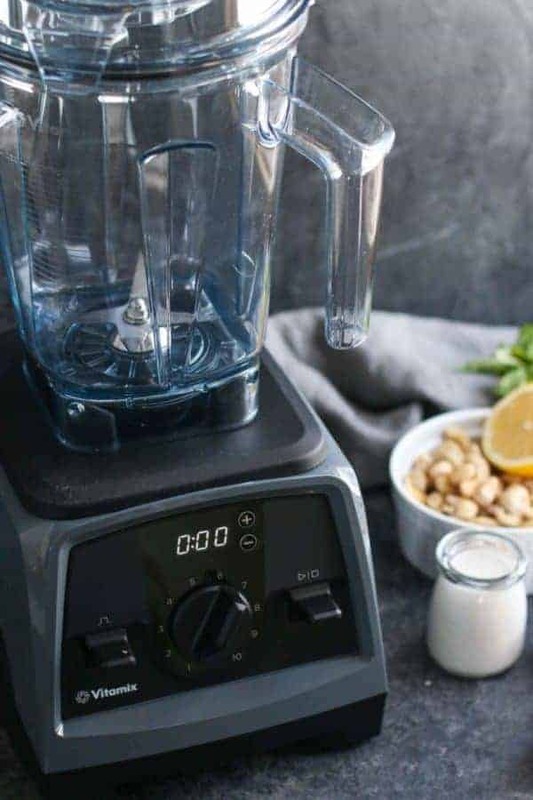 Can a regular blender be used? Yes, you may use whatever blender you have. Enjoy! Made this tonight, LOVED it!! So great to hear that you loved this recipe! Can you use regular whole milk in place of the almond milk, or will it ruin the flavor? Also, if you don’t have a vitamin, is it possible to make the sauce in my cuisinart food processor? You may use whole milk in this recipe. And yes, you can use a food processor to make the sauce. Enjoy! Wow! We are so humbled. Thank you! We love hearing when our recipes are well-loved by families like yours. I don’t even like Alfredo sauce but the photo sucked me in, and boy am I happy. It was deeeelish!! Next time I’ll add a little more salt. If in doubt, make it, you won’t regret it. I’m a girl about shortcuts and used rotisserie chicken, because why not?!?! So good, yum! 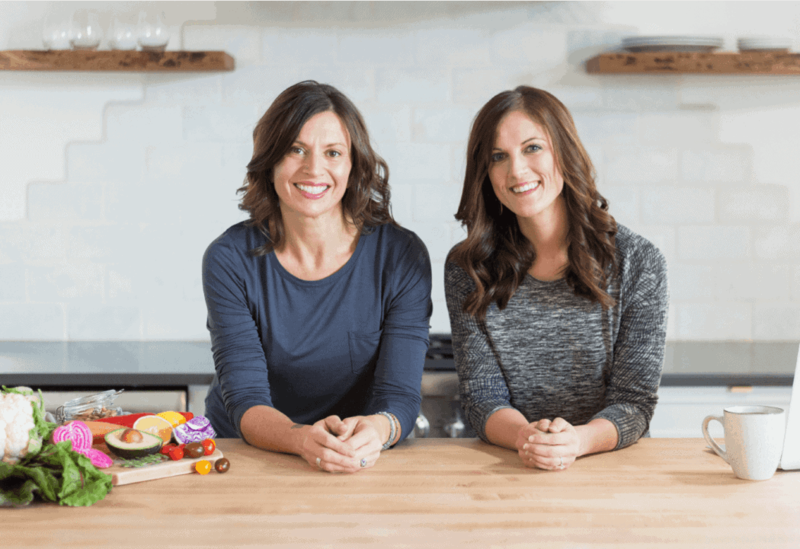 Another great recipe from Jessica and Stacie! Rotisserie chicken is a fantastic shortcut for this recipe – no shame in shortcuts! This was delicious and heated up well for leftovers. I cooked my spaghetti squash in the instant pot and it was even easier. Hello! 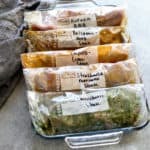 I am soooo excited to be making this recipe for my meal prep this weekend! I was just wondering about the nutritional yeast – and where I would find a compliant Whole 30 one? I have tried to google and nothing definite really pops up. Please help, thank you! All nutritional yeast should be compliant unless there is something added to it like dextrose or another anti-caking agent. Hi! Can I make this sauce in advance and store in the fridge for a few days? Thank you! Yes, you can make the sauce and store it in the fridge for up to 3 days. What brand of nutrional yeast do you buy? 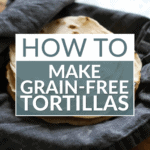 I often buy mine from the bulk section of Whole Foods or my local natural foods market. Bragg’s also makes a good one that’s organic. Can I sub dried basil? A half cup on fresh basil in Michigan in the winter is really expensive! I LOVE THIS RECIPE!!! 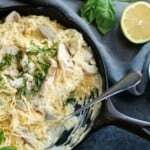 I made it last night, and my husband was shocked to find out it actually tastes better than normal chicken Alfredo! We loved it! So easy to make too. Great job ladies! Whoa!! Now THAT’S a serious complement! So glad you guys loved it. Going to try this sauce for our family Valentine’s feast tomorrow! Costco just started carrying organic uncooked Fettuccini so my plan is to double the sauce recipe & use half for my squash noodles & the other half for the noodles that my kids will actually eat! Very excited to try this, so far I have had lots of success with cashew based sauces. Yum! Made this the other day and it ROCKED!!! Thank you for a yummy recipe! I just finished up the Whole30 elimination diet, but enjoyed it so much I decided to keep going! I’ve cooked 2-3 new recipes every week and I gotta say this is by far my favorite Whole30 recipe! I even added some mushrooms, broccoli, and red pepper! Upon tasting it there were definitely tears, I called my roommate to come home and eat it with me, and definitely texted several family members to drop everything and start cooking. Needless to say, thank you sweet sweet Whole30 wizard. This is music to my ears eyes! I’m so happy you loved this recipe – I have to admit that I felt the same way. It had been years since I had a big plate of fettuccine alfredo and this was like a sweet homecoming for the tastebuds for me as well. This was amazing! I made it tonight for dinner and I loved it!! 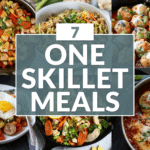 I made the spaghetti squash and chicken in my instant pot, so it was even quicker. I will definitely be saving this recipe to make again. Yayyyyyyy!!! So glad you loved this recipe. This was amazing!!! Thank you so much for sharing. It’s hard to find dairy free versions of classic meals. This Alfredo Sauce is amazing! If I wanted to batch make the alfredo sauce and refrigerate or freeze. How long would it last in either place?? I haven’t tried freezing it yet so I can’t speak to it’s texture once thawed. However, it will keep in the fridge for up to 4 days. Thank you! We love hearing this. Not sure what I did wrong but it is way too sweet. Maybe the milk. It could be your milk. You definitely want to use one that does not have any added sugar. Even then, I have found variations in the perceived sweetness (and I say ‘perceived’ since we all detect flavors differently and have different thresholds for sweetness) between different types of non-dairy milk – with coconut milk being the sweetest followed by macadamia nut and cashew milks. If it’s not too late, you can add a pinch of garlic powder and possibly some crushed red pepper to the sauce to help balance that sweetness. A little more lemon juice may also help. This was fantastic! Who knew cashews could make an alfredo sauce substitute? Thank you very much for a yummy recipe. My husband and I gobbled it up! We’re so glad you loved this! You might also like this Dairy-free Mac & Cheese or Vegan Nacho Cheese, too. Added red pepper flakes for a little heat. SO GOOD! OUTSTANDING!!! I’ve attempted many healthy Alfedo recipes but this one is outstanding and healthy!! Made it exactly as these amazing women posted except I used blender, super easy> First time using nutritional yeast and its now a staple. Don’t hesitate make it!!! WOW! 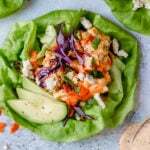 Thank you for your kind words – we’re so happy that you loved this recipe and that you found nutritional yeast – it’s such a great ingredient and so versatile when you want that cheesy-savory-umami flavor in a dish. Why is sodium count that high. I would probably use very little. Have high blood pressure and a problem with dairy. At 306mg per serving the sodium content is actually quite low (unless you are following a 1500mg or less plan). However, you can leave the salt out of the sauce to reduce it further if that meets your needs better. Hope that helps! Just put this on the dinner schedule for next week! I think I will add spinach to the sauce and put it over zoodles. I can’t wait!! This is the best Whole30 recipe I’ve made in my 6+ months experimenting with Whole30 recipes. Well done!! So rich flavorful (in a not overly heavy way). WOW! This is amazing and totally makes our day! Thank you for sharing! great to hear you enjoyed this recipe! You could certainly add more milk or broth to thin it out a bit. And yes, we love our Vitamix!! I just made this tonight and it is AMAZING! the kids also loved! I cooked the squash in the microwave (face it down in an inch of water. I used full fat coconut milk. So glad you loved this recipe! Thanks for sharing how you prepared the squash and what you used in the sauce. What can I use in place of yeast since I’m sensitive to it? You can leave the yeast out and add 1/2 tsp. dijon mustard instead to get that savory/umami flavor. You can definitely substitute cashew butter for the soaked cashews. As for how much, I can’t say for sure since I haven’t tried it but my guess would be to start with 3/4 cup then increase as needed until you get the consistency you desire. The recipe is awesome! We no longer eat dairy and I have missed my Alfredo sauce! No any more! This recipe was a huge hit in my family! Yes, you can use a blender of your choosing (or a food processor). You may just need to blend it a little longer and scrap the sides as needed. Hope you give this recipe a try! It’s so so good! So this looks unbelievably amazing but I’m allergic to cashews. 🙁 Are there any other nuts that could possibly have a similiar result? Macadamia nuts are a great stand-in for cashews here. It is delicious!! I will definitely make it again. Hands down one of the best alfredo alternatives my husband and I have tasted. For the first time in a long time, there is no need for us to alter the recipe in any way! I love this! Thank you for sharing and so thrilled to hear you found a keeper with this recipe. Do you have a recommendation on substitutions for the cashews if there is a nut allergy? Since cashews are the main ingredient in this recipe, we do not have a substitution. You could try a blend of sunflower seeds and pumpkin seed but the flavor will be a little different. Keep us posted if you find a substitution that works! Have you tried this without nutritional yeast? I’ve used it in a couple recipes and the entire meal goes to waste because none of us can stand the taste. But I like that this is made without coconut milk. Thank you!!! You can leave out nutritional yeast if it’s not your jam. However, to give it that savory tang you can add a little dijon mustard to the sauce instead. I just made this and it was delicious! 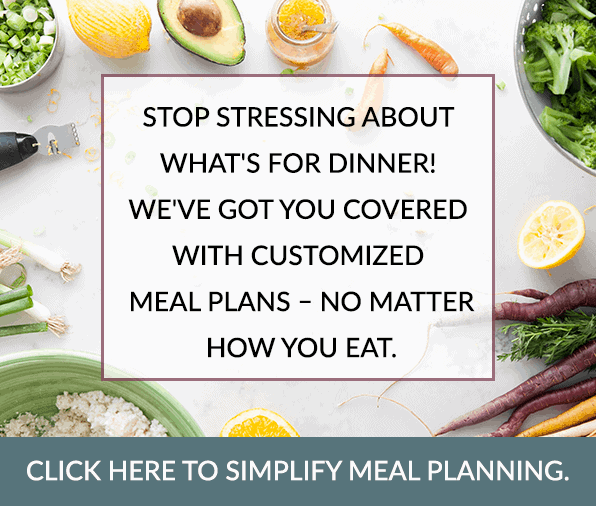 Thanks for making easy recipes that are filling, taste great and are good for you! You guys rock! I bought roasted cashews not even realizing it. Will these work instead of raw? They should work. You may need to soak them and blend them a few minutes longer to get a really creamy consistency but I don’t think it’s a deal breaker at all. If they’re salted, leave the salt out of the sauce when you blend it then taste and adjust the salt as needed. I’d recommend using the sauce in this recipe instead: https://therealfoodrds.com/dairy-free-mac-and-cheese/. It is nut free! This was really good! Never tried a dairy-free sauce like this before and I’m a fan. Vitamix made it super easy. I think if I’d told my husband it was a dairy-free vegan cashew sauce he would have been weird about eating it, but I just said it was a garlic sauce and he ate it all up and loved it! I made a Cajun, vegan version using Gardein “chicken”, hemp milk, cayenne peper, onion & garlic powder, Better than Bullion beefless seasoning and vegan Follow Your Heart mozzarella “cheese”. I have never used spaghetti squash before and myself as well as my boyfriend was blown away from this recipe idea. Even though I used a blender, it was wonderful. I will definitely be investing in a Vitamix soon! Thanks! Wow! This is honestly soo delicious. I don’t even miss traditional Alfredo sauce when I eat this! I swapped chicken for shrimp, added some spinach and italian seasoning. This will definitely become a staple in my house! Love it! I agree with you – this is one of my favorite sauces too. I have cashew milk but no cashews… will that work? Would you know the amount to use? Unfortunately, cashew milk won’t work as you need the ‘meatiness’ of the cashew to create a thick sauce. Can’t wait to try this! Would coconut milk work in place of the almond milk? Is full fat too rich? (That’s what we have in the pantry and we don’t drink almond milk). Hi Rachelle! We have not tested this recipe with coconut milk but I don’t see why it wouldn’t work. If you give it a try, we’d love to hear how it turns out! I’ve never made alfredo sauce from scratch before, especially using cashews! this was absolutely delicious! Very easy to make. This is so great to hear! Glad you loved it and found it easy to make.